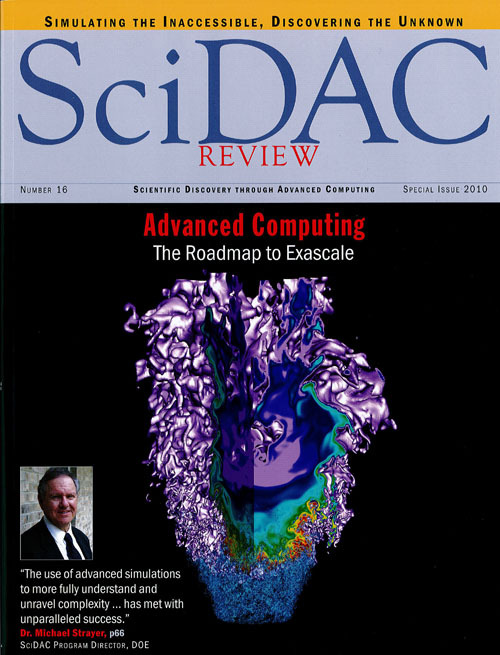 SciDAC Review Special Issue 2010 - Simulations that ran on the Franklin Cray XT at NERSC captured the detailed structure of a lean hydrogen flame on a laboratory-scale low-swirl burner. Image courtesy of M. Day, LBNL. Visualization generated using VisIt by M. Day and A. Nonaka (LBNL CCSE) with help by G. H. Weber (LBNL Vis Group/NERSC Analytics). More information. 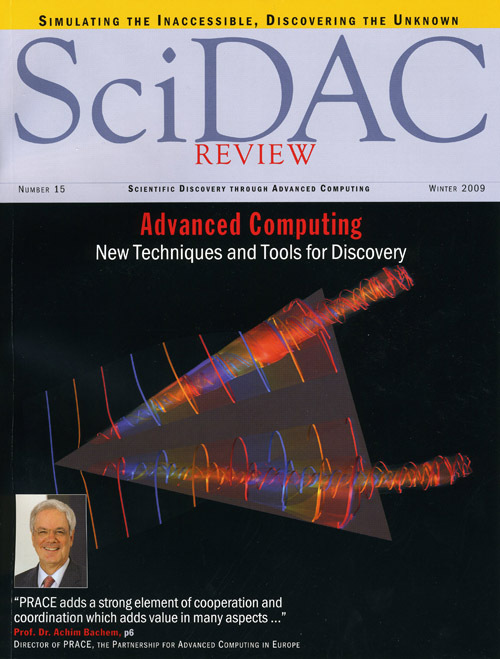 SciDAC Review Winter 2009 - New visualization techniques developed in VACET provide insight into the complex structures of vector fields. Here, an Integral Surface illustrates vortex formation in the flow field above a wing. Image courtesy C. Garth, UC Davis. 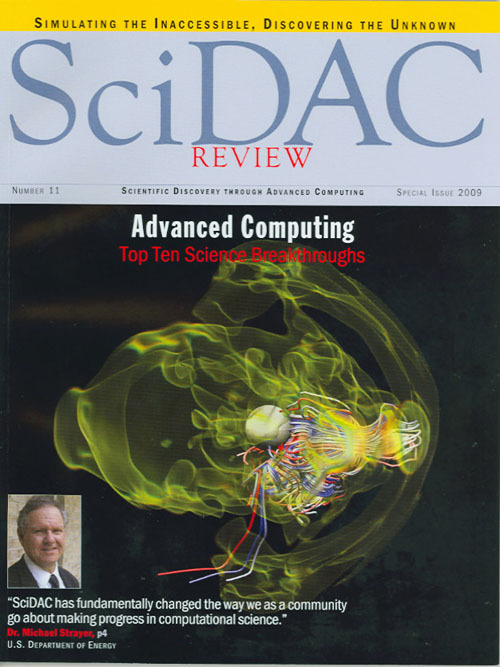 SciDAC Review Summer 2009 - Massively parallel VORPAL simulations of LOASIS (LBNL) experiments show the structure of a plasma density wave, or wake (blue), driven by an intense laser pulse traveling upward through the image. Simulation by C.G.R. Geddes (LBNL). VisIt visualization by G.H. Weber and C.G.R. Geddes (LBNL). 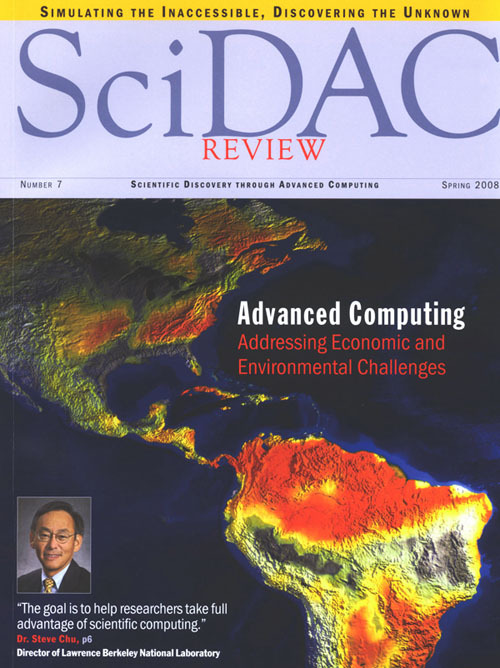 This image appeared on the cover of the Summer 2009 issue of SciDAC Review. 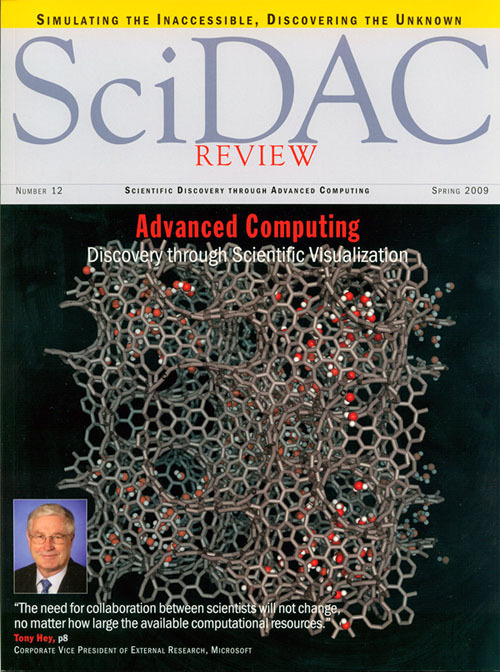 SciDAC Review Spring 2009 - Molecular dynamics simulation of confinement and dispersion of small molecules within carbon nanostructures, mimicking the dynamics of electrolytes in porous carbon materials. The visualization was generated by the SciDAC code VisIt. 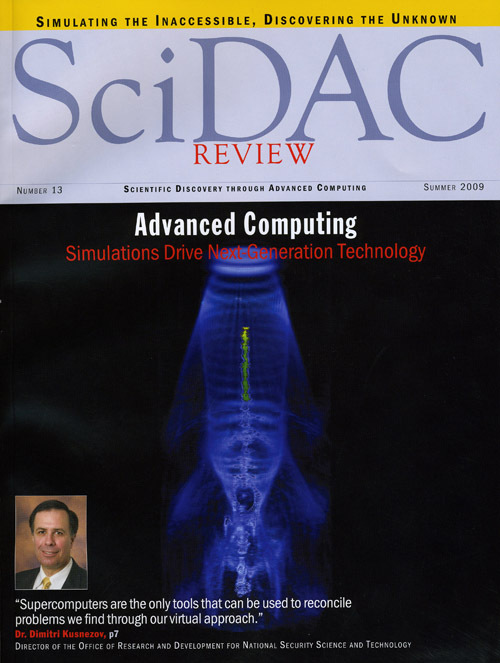 Simulation: Dr. Vincent Meunier, ORNL. Visualization: J. Meredith and S. Ahern, ORNL. SciDAC Review Special Issue 2009 - Fluid velocity streamlines during a type II supernova collapse. 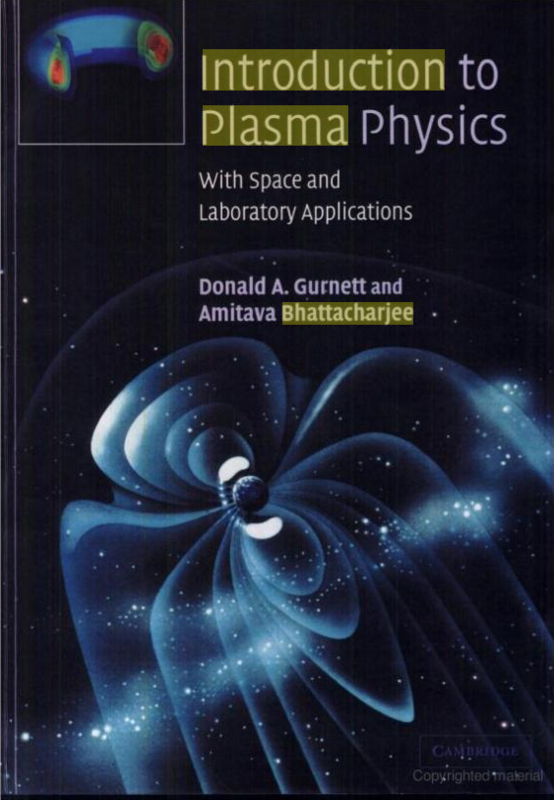 - Visualization by D. Pugmire (ORNL), and simulation by E. Endeve, C. Cardall, R. Budiardja (ORNL and U. Tennessee-Knoxville) and A. Mezzacappa (ORNL). 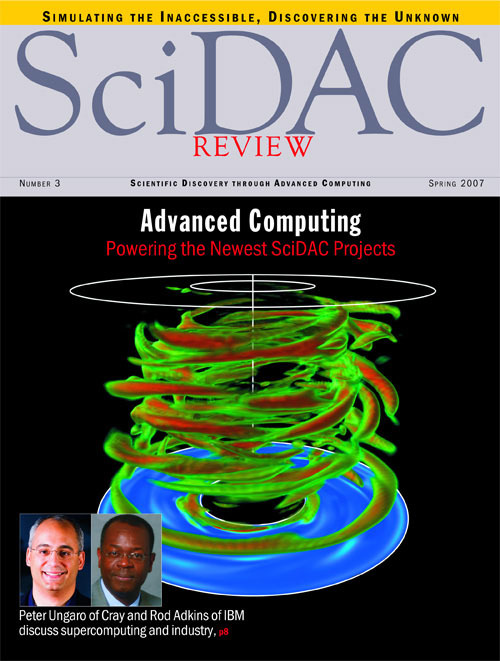 SciDAC Review Spring 2007 - Visualization of magnetically unstable cylindrical Couette flow simulation.